The Nirbhay, meaning “fearless,” is a land attack cruise missile (LACM) currently under development by the Republic of India’s Defence Research & Development Organisation (DRDO). This solid fuel, nuclear-capable missile has been designed to be dispatched from mobile launchers and travel up 1,000km at speeds nearing Mach 0.7. With an on-board computer system and active radar guidance, the Nirbhay has a reported accuracy of 10m CEP and is claimed to be capable of flying at “tree-top” levels to avoid radar detection. However, while the LACM’s development was slated to be completed by December 2016, a string of failed tests has caused the DRDO to extend this deadline until June 2018. 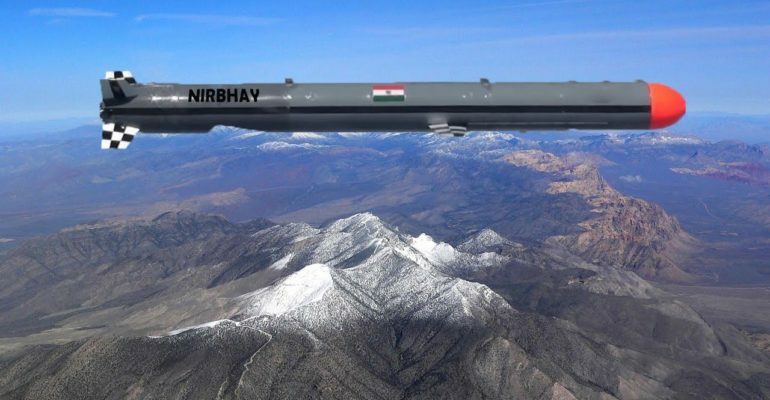 If successfully completed, the “Nirbhay cruise missile will fill a vital gap in the war fighting capabilities of [India’s] armed forces,” according to Dr. Avinash Chander of the DRDO. Intended to be launched from land, air, and under water, the Nirbhay would substantially augment India’s limited nuclear strike capability against Pakistan. Given the missile’s repeated failures, however, India may eventually be forced to abandon the Nirbhay and pursue other designs in its quest to acquire an LACM with U.S. Tomahawk-like capabilities. Financial Express, “Nirbhay: Know about India’s 1000-km Range Sub-Sonic Cruise Missile, That Failed in its Test Flight Yet Again,” December 22, 2016, http://www.financialexpress.com/india-news/nirbhay-sub-sonic-cruise-missile-test-flight-details-india-drdo-defence/482566/. Franz-Stefan Gady, “Bad News for India’s Deadliest Sub: Nirbhay Cruise Missile Fails Test (Again),” The Diplomat, December 23, 2016, http://thediplomat.com/2016/12/bad-news-for-indias-deadliest-sub-nirbhay-cruise-missile-fails-test-again/. Center for Strategic and International Studies, “Nirbhay,” Missile Threat, last modified August 11, 2016, https://missilethreat.csis.org/missile/nirbhay/. S.K. Jindal (ed. ), “India Conducts Successful Flight Trial of Nirbhay Sub-Sonic Cruise Missile,” Defence Research & Development Organisation Newsletter Vol. 34, No. 11 (November 2014): 4, http://www.drdo.gov.in/drdo/pub/newsletter/2014/november_14.pdf. Kulsoom Belal, “Cruise Missiles in South Asia: Implications for Regional Stability,” Policy Perspectives Vol. 13, No. 1 (June 2016): 127, ProQuest ID 1798724748. Aditya Bhat, “Nirbhay Cruise Missile: Should the Project be Junked?” International Business Times, December 24, 2016, http://www.ibtimes.co.in/nirbhay-cruise-missile-should-project-be-junked-709640. Gabriel Dominguez, “India’s Nirbhay Cruise Missile Programme Extended by 18 Months, Says Report,” IHS Jane’s, January 20, 2017, http://www.janes.com/article/67103/india-s-nirbhay-cruise-missile-programme-extended-by-18-months-says-report. Belal, “Cruise Missiles in South Asia: Implications for Regional Stability,” 124.